Here is commission I am working on for one of my fans. 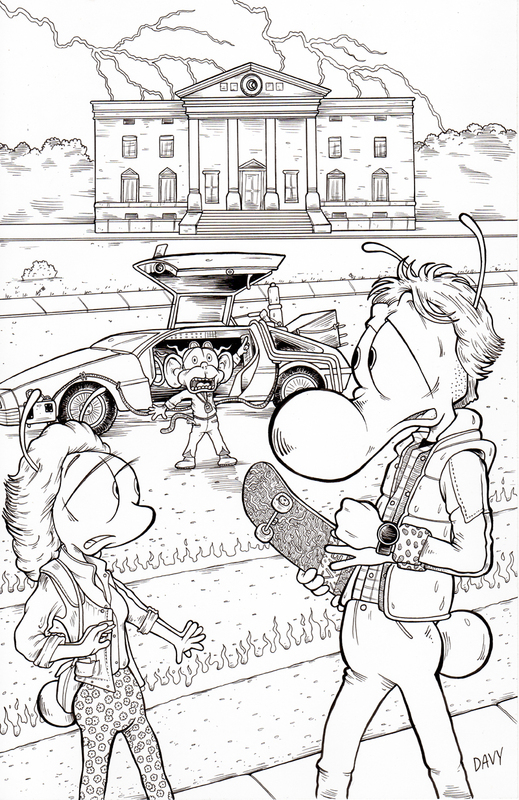 Charmy takes on the role of Marty McFly! This was an amazingly fun piece of art to draw up. I went WAY overboard again on the detail. I love the flowered pants worn by Jennifer Parker, parodied here by Frenchy. The skateboard detail was insane too! I love going the extra mile for my readers. Doc Brown is played here by Flimp the Chimp. He makes the perfect parody for Christopher Lloyd’s iconic interpretation of that crazy inventor. This is the second time I was asked by a reader to create a parody of Back to the Future. This is the best of the two commissions by far. If you want to see more art, click HERE. To see more of my comic strip, click HERE. Next postBack to the Future Mashup WITH MARKERS!